Millie has been battling addiction, violence, and poverty all her life. The child of low-income parents who grappled with alcohol addiction, Millie grew up in a turbulent, sometimes violent household. The man that she later married also had an alcohol addiction and violent tendencies. After seven years of unhappy marriage, Millie found herself the single mother of two young children. It had become unsafe to stay under the same roof as her ex-husband, so Millie and her kids slept in her car for several nights until they could get in to a shelter. Millie worked in the oil & gas industry for over eight years and believed that her stable employment during that time helped to provide a foundation of positive growth for her children. Her son would go on to become a personal trainer; her daughter would later get her Masters in Education and become a teacher for children with special needs. Millie is unable to conceal the pride in her voice when talking about how well her children have done for themselves. However, Millie’s journey has been far from easy. After years of refraining from drinking for fear of following in the footsteps of her parents, Millie succumbed to alcohol, triggering a lifelong addiction. Alcohol became the only way Millie could cope with her painful past. Although there were times in her life when it seemed to lift, Millie’s addiction always returned. Two years ago, Millie’s rent was raised unexpectedly. 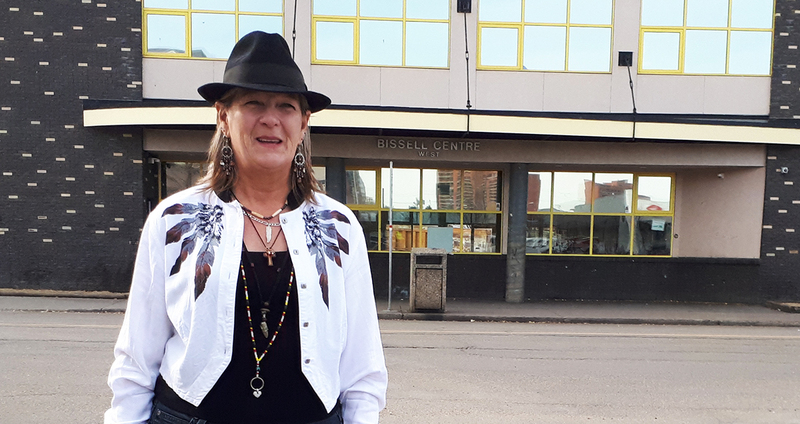 She knew she needed help if she wanted to stay off the streets, so she applied for assistance from Bissell Centre’s Community Bridge Program. Community Bridge helps individuals in danger of eviction pay for rent and utilities and offers additional support in the form of education and workshops. Community Bridge was able to help Millie afford her rent while she focused on her health and overcoming her addiction. Without the program, Millie believes she would have been evicted and left homeless once again. The years since Community Bridge’s intervention in her life have been difficult, but today Millie is finally living in a stable home: a two-bedroom condo that she shares with her daughter. Currently, Millie is a Peer Outreach Worker and a Board Member for Aawear through Streetworks that provides street-level support for people dealing with addictions. She has been volunteering at Bissell Centre, the Co-op, and the Edmonton Native Healing Centre. She has been sober for almost a year. Bissell Centre’s Community Bridge Program is funded by a collaboration of numerous supporters, including ENMAX who helps to cover the costs of utility bills to ensure individuals and families struggling with poverty remain housed. Please visit our Housing Services webpage to learn more about our Community Bridge Program.